Please join me at Microsoft's MVP summit next year! As I write this I’m on my way with Ben to the annual MVP conference at Microsoft’s campus in Seattle. The annual summit last four days and all expenses but your flight and transportation on the first and last day are covered. (If you don’t share a room with another MVP you do have to pay for half of the hotel bill, which I do). We get to hobnob with the Access team program managers and some of the programmers. The event is only open to MVPs and you’d be surprised with the many areas through out Microsoft’s portfolio of products that have them: from Word to XBox, we all meet as one. Although I can’t tell you what’s discussed needless to say it’s high level and valuable. This year two of my friends received the award: Luke Chung from FMS and Jack Stockton from PAUG, both very deserving. I’d love to see more of my blog readers with great knowledge of Access and who give back to the community at next years event. There are two ways to receive the award: someone can recommend you or you can apply here. Giving back to the community can be as easy as replying to requests for help at forums such as utteraccess.com, creating an Access blog, speaking at events or doing online training for free. I do all of the above. I’ve seen some reach the honor by just being a book author on Access. The exact combination and how much to give back in order to reach MVPness is not known. I hope to see more of you at next years event! Can people attend this event if they are not MVP’s yet? For a cost? I would love to go. I am somewhat tired of “not knowing” in person all the people online I’ve made acquaintances with over the past 10 years, many of whom I know go to the Seattle conf. Hope to meet you one day at the event! 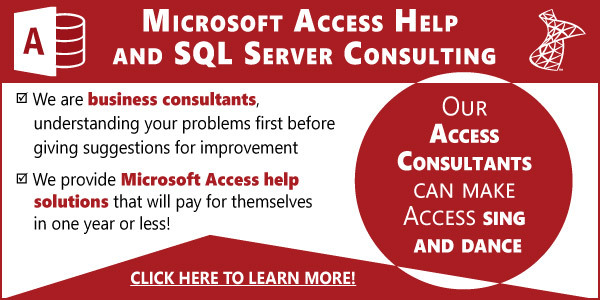 Thanks Ben, do you know whether the video to http://accessexperts.net/blog/2013/01/06/wedenesday-january-9th-back-by-popular-demand-optimizing-access-with-sql-server/ is available? Yes. It’s the first link listed on the http://accessexperts.net/blog/starthere/ which also contains additional contents that should help. Are there any Italian Access MVP’s?